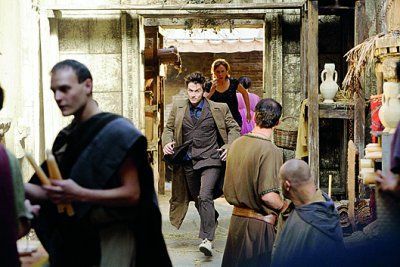 The One Where: Our chums visit Pompeii the day before the volcano explodes, but the Doctor won't help Donna save the people of the city because it's a fixed point in time… until it emerges that a cult of soothsayers, working for alien Pyrophiles, is actually threatening the whole world. Verdict: Just as last series kicked off with a comedy episode then went straight into something sumptuous and historical, so this series follows suit: after the light touch of "Partners in Crime", we find ourselves whisked off to ancient Roman times. It looks amazing, and the story is a meaty one with an opportunity for Donna to weep… and provide the first real, angry challenge the Doctor has had to his authority. Tate is proving that she can be strong as the Doctor's conscience. The running gag about her being heard as Welsh whenever she speaks Latin is played well, it's cute that the TARDIS is built into the Sibylline prophesies, and I like the asides about the burden of the Time Lords (that they can see what can't be altered in time). The Shadow Proclamation has now been mentioned twice this series now… hmm. The CGI on the Centurion-like Pyrophiles is stunning! Prophecies: The Sibylline prophetess tells Donna she has something on her back, and then tells the Doctor that "she is returning" (presumably Rose). She mentions the Cascade of Medusa (there is a reference to sealing the rift at the Medusa Cascade last series). Whoniverse: There is a reference to the 1965 William Hartnell adventure "The Romans", when the Doctor says he had nothing to do with the fire of Rome ("Well, not much"). Did you spot? : The Roman family's names are taken from the family Caecillius who appeared in Latin O-Level textbooks! Trivia: The eruption of Vesuvius depicted in this episode is dated to 24 August AD 79. There are a number of Sibylline traditions in Roman mythology (it just means "prophetess") but the earliest Sibylline texts are thought to date from the 6th century BC. Donna: "… And so am I."